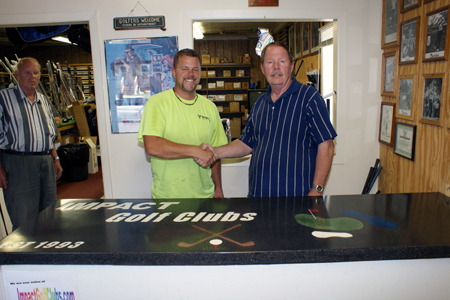 When the owners of a golf shop approached Tony Angell to create a concrete countertop for their store remodel, they originally wanted just a plain, black countertop. That would have been fine, but not much of a challenge for Tony and not much of a focal point for the store. Instead of just settling for an average project, Tony turned this into a showpiece for both him and the golf shop. Here’s how he did it. The owners were friends of the family, and familiar with the quality of Tony’s work in his Hugo, Minnesota based company, North Metro Concrete and Countertops. When Tony suggested getting creative, they said, “Go for it. We trust you.” And Tony did. 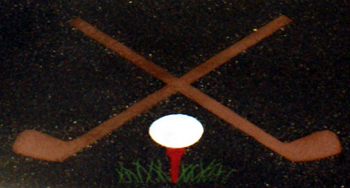 The finished countertop incorporates the store’s name, a green, a water hazard, a sand trap, two golf clubs in the traditional crossed pose, a golf ball, blades of grass and a tee. Tony’s original concept was to incorporate the store’s name, and then add some green grass to represent a golf course. But when you have a golf course, you have to have water hazards and sand traps. And you can’t play golf without a club, ball and tee. So the design kept evolving and growing as Tony used his imagination. While other areas were pre-formed with foam, to create the blades of grass, Tony first cast that area in solid black, then used a dremmel to etch the blades, then filled them in with green grout. He filled in the white areas last so that other colors wouldn’t bleed into it during processing. The letters had to be put in the form upside down and backward, so Tony triple-checked his layout to make sure he had not reversed a letter. All of this required probably three times more thought, planning and work than a plain black countertop, but the results are orders of magnitude more impactful. Now Tony has an amazing showpiece in a store trafficked by golf enthusiasts such as doctors and lawyers. He has some extremely happy clients who will enthusiastically recommend him, plus display his business cards and brochures on the counter. Best of all, he got himself and his wife a set of custom golf clubs in the deal. I’m sure he’ll put them to good use, and he can even do some networking on the golf course. Tony attended The Ultimate Concrete Countertop Training in March 2011.